From what I recall of my childhood, Dr. Martin Luther King, Jr.'s civil rights movement was not universally embraced in the black community. Some blacks were frightened by his actions and angry at the “crazy” colored man for stirring up trouble. “He is making things worse for Negros!” MLK became an American icon. Considering that slavery was the norm, founding father Thomas Jefferson calling slavery a “moral depravity” and the greatest threat to the survival of our new nation was a “crazy” thing to say. Talk about history repeating itself, attempts were made to seduce Jefferson with “fixes” for slavery. If slavery could be made kinder and gentler, that would nullify the need to repeal it. Jefferson did not fall for their trap. He demanded total repeal. The Obama Administration is attempting to bamboozle Republicans with “fixes” for Obamacare. 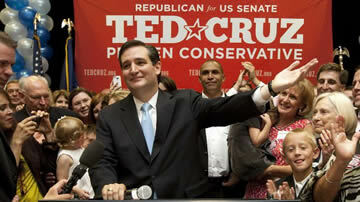 Like Jefferson standing firm on repealing slavery, Sen. Cruz has stood firm on the total repeal of Obamacare. It was pretty “crazy” for Gen. George Washington and his rag-tag Continental Army to resist the mighty British. In the winter snow at Valley Forge, Washington and his troops had no heat, not enough food, medicine or doctors; 2,500 troops died from the severe conditions and another 2,500 went home. Only 6,000 cold starving soldiers stayed to fight. Freshman Senator from Texas, Ted Cruz is an eagle. Sen. Cruz along with Sen. Mike Lee tried to warn Americans about the horrors awaiting them as a result of Obama's infamous lie which says you can keep your health care plan and doctor. Cruz also tried to sound the alarm regarding the catastrophic job-killing aspects of Obamacare. Sen. Cruz lead the charge to defund, delay and ultimately repeal Obamacare. As are all great leaders, Cruz was vilified; called crazy, stupid, a domestic terrorist and worse. Contributing to both political party's and the media's hatred for Sen. Cruz are his values which are in line with the Tea Party; God, family, country and fiscal responsibility. How in the world do liberals get away with equating wholesome traditional American standards with extremism? And yet, such is the war in which we find ourselves. Sen. Cruz's values are in his heart. The apple did not fall far from the tree. At a Tea Party rally in Texas, I had the pleasure of chatting with Ted's dad, Rafael Cruz. In a nutshell, the Cruzs are real deal conservatives. The senior Mr. Cruz shared his inspirational tale of coming to America with such passion, gratitude and genuine love for America that it brought tears to my eyes. A “Wanted Politically Dead or Alive” bounty is out on Cruz's head for daring to go against the establishment. Like Don Michael Corleone told his brother Fredo to never go against the family before having him murdered, freshman Sen. Cruz was expected to know never go against the Washington DC establishment. Republicans, Democrats and the media would love to see Sen. Cruz politically sleeping with the fishes. As we approach Thanksgiving, I wish to thank God for our precious hand full of true patriot politicians – men and women of character and honor who love their country and are willing to take the arrows and suffer humiliation to preserve and restore our lost freedoms, liberty and culture; serving as courageous advocates for We The People. Five million devastated Americans have lost their health care plans. At least 129 million more are expected to be unable to keep their health care plan due to Obamacare; confirming that Sen. Cruz's leadership efforts to stop the insanity was right. Thank you Sen. Cruz. Thank you very, very much. We The People are extremely grateful and truly appreciate you. Happy Thanksgiving! Sen. Cruz along with Sen. Mike Lee tried to warn Americans about the horrors awaiting them as a result of Obama's infamous lie which says you can keep your health care plan and doctor.